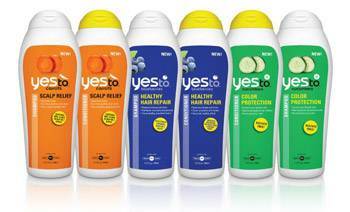 Say 'yes" to turning heads with Yes to™'s brand spanking NEW range of shampoos and conditioners, designed to give all types of hair the tender loving care they deserve. Packed with scrumptious natural ingredients to nourish, protect, and repair, the new Yes to™ hair care range includes the Yes to™ Blueberries Healthy Hair Repair Shampoo and Conditioner for damaged hair, Yes to™ Carrots Scalp Relief Shampoo and Conditioner for a dry scalp the Yes to™ Cucumbers Color Protection Shampoo and Conditioner for coloured hair. The natural formulas found in these beauties give hair its bounce, shine, and softness back! Like all Yes to™ products, Yes to™'s new hair care range is over 95% natural, packed with fruits -n' veggies, have proven results and are free from petroleum, SLS, silicones, parabens and phthalates. The Yes to™ Blueberries Healthy Hair Repair Shampoo (RRP $9.95) and Conditioner (RRP $9.95) offer the perfect combo to combat dry, distressed hair from heat styling and chemical processing treatments. Bursting with nourishing ingredients like antioxidant-packed blueberries to protect against damaging free radicals, clover flower to help heal and mend, and sunflower, a powerful source of vitamin A, B and E, this dynamic duo is clinically proven to give you healthier looking hair in just seven days! These two blueberry beauties are brimming with 98% natural ingredients. Say YES to natural, stimulating relief for your scalp with the help of Yes to™ Carrots Scalp Relief Shampoo (RRP $9.95) and Conditioner (RRP $9.95). These pH balanced products combine tea tree and lemon oils to help protect against irritation, while salicylic acid helps reduce flaking. And of course, taking centre stage are beta-carotene and vitamin A rich organic carrots, helping to heal dry scalps and stimulate healthy hair follicles. Meanwhile, cypress oils provide intense nourishment, without weighing hair down. Powerful enough to soothe dry, flaky scalp in 7 days, yet gentle and nourishing enough to leave hair shiny, hydrated and healthy, this is the perfect pair for those who experience a dry scalp. This carroty couple contains 95% natural ingredients. Keep your hard earned colour in check with the sulfate-free Yes to™ Cucumbers Color Protection Shampoo (RRP $9.95) and Conditioner (RRP $9.95). Formulated with apricot, which strengthens hair follicles for vibrant color, aloe to moisturise and of course organic cucumbers to gently cleanse and strengthen, the Yes to™ Cucumbers Colour Protection Shampoo and Conditioner will protect hair colour and leave hair looking shiny and healthy. The Yes to™ Cucumbers Colour Protection Shampoo contains 99% natural ingredients while its conditioner side-kick is 95% natural. Yes to™ products are available at Priceline and selected stockists. Visit www.yestocarrots.com to check out the full Yes to™ range.